These sexist Christmas sweaters are just plain wrong. 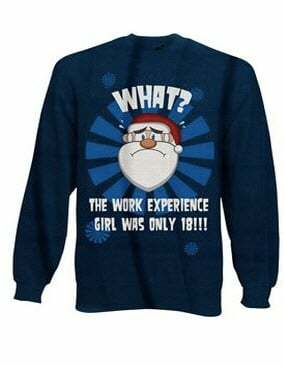 These cringe-worthy, sexist Christmas sweaters are just terrible. So you know what doesn’t fill me with Christmas spirit and festive cheer? These stupid, intentionally sexist novelty sweaters. This is not a festive prank. A UK retailer has actually been manufacturing these sweaters in the lead up to Christmas, and not surprisingly, they have caused a stir around the world. Now, I’m assuming they are supposed to be worn ironically – at office Christmas parties, perhaps? Clearly, they are meant as a joke, and not to be taken seriously. But still – they make me feel icky. Because they are just another reminder that women are continually viewed as sexual objects by society. And I can’t imagine these being okay at even the most politically-incorrect office. Riggght. Because nothing is funnier than jokes about requesting BJs from your colleagues, or banging barely-legal interns. Gross. What are your thoughts on these sweaters?